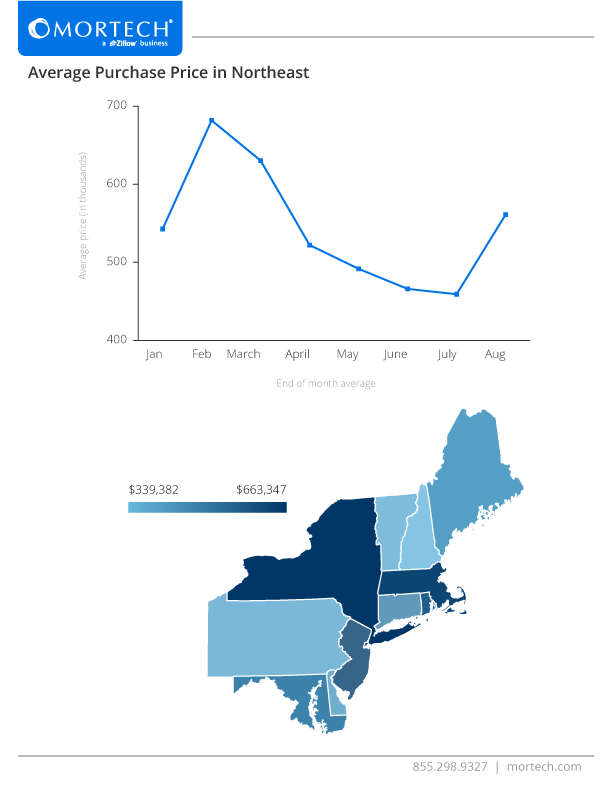 With the New England Mortgage Bankers Convention happening this week, we wanted to take a closer look at mortgage loan trends in the Northeast region, specifically the average purchase price by individual state. We pulled some data internally from within Marksman to see these averages take shape throughout 2015. Since January, average purchase price for the region has fluctuated pretty greatly, and is currently on the rise after hitting its lowest point of the year. Not surprisingly, the average price was at its highest in February, when rates were low, in relation to how they’ve progressed throughout the year. And, as rates begin to rise up to this point, the average purchase price has reflected that by dropping down to its lowest point in July, before beginning to rise again. Looking at each individual state gives us a better idea of how this average is distributed across the region. New York is, unsurprisingly, on the high end of average purchase prices since the year began, as is Massachusetts, whereas Pennsylvania, Vermont, and New Hampshire all have the lowest averages. The difference between the higher and lower states is roughly 300 thousand dollars, making it a pretty wide margin between the two. No matter what the purchase price of the loan is, none of them can happen if the right rates aren’t posted quickly and accurately. Luckily, Mortech and Marksman can do just that, while also providing your business tools to succeed and grow, bringing in and nurturing more leads along the way. Find out more about what you could do with the power of Marksman today.